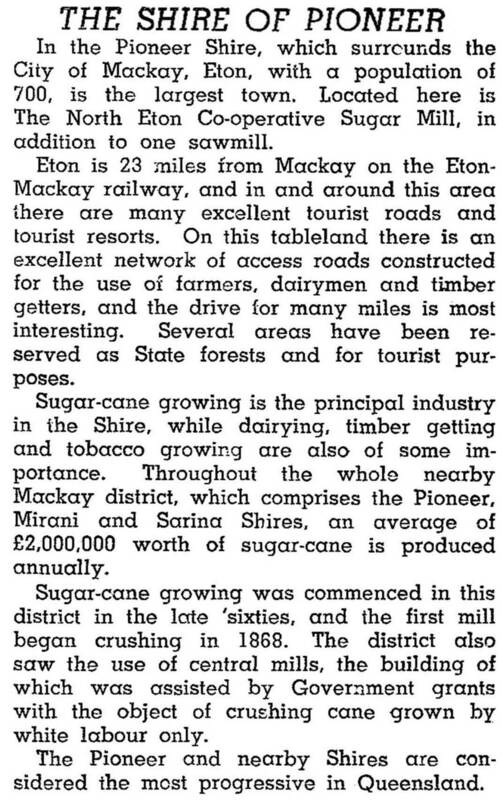 Pioneer Shire, a coastal municipality which entirely surrounded Mackay city, contained much of the Mackay region's most productive sugar cane farms. It adjoined Sarina Shire to the south and Proserpine Shire to the north. Named after the Pioneer River (itself named after HMS Pioneer which was used for exploration of north Queensland in 1862), the shire (originally a divisional board) was established in 1880. Mackay had been a municipality since 1869. By the 1970s suburban Mackay had spilled into the shire. In addition to seaside areas such as Bucasia and Slade Point, North Mackay, Andergrove and Mount Pleasant were in the shire. Most of Mackay's beach facilities were provided by Pioneer Shire, beginning with toilets and change sheds at Seaforth in 1923. Urbanisation also put pressure on some of the shire's most productive cane lands, and planning controls at Farleigh and Racecourse put a brake on speculative subdivision in the 1950s. The notion of Shire-City amalgamation arose in the 1920s, and in 1949 Mackay's Mayor and Federal Senator, Ian Wood, proposed a Greater Mackay scheme including the harbour, racecourse, golf course, cemetery and seaside resorts. That and successive proposals did not eventuate, until in 1994 the whole of Pioneer Shire was united with Mackay City. By then three-quarters of the shire's population was considered to be in metropolitan Mackay. At the time of amalgamation Pioneer Shire had 41,000 people and Mackay City had 23,000.